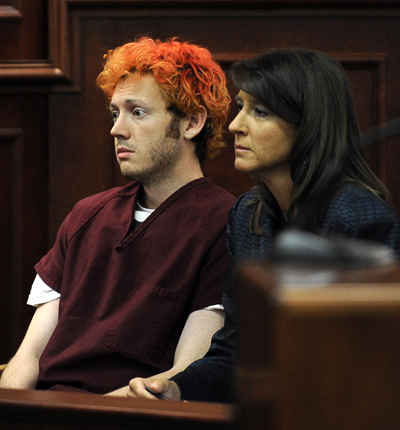 The public and the news media will be barred from a pretrial hearing in the Colorado theater shooting case that will include testimony from a psychiatrist who evaluated whether defendant James Holmes was insane, the judge ruled Friday. Arapahoe County District Judge Carlos A. Samour Jr. said testimony from the psychiatrist and other witnesses would “infect a large portion of the jury pool with factual information” about Holmes’ sanity and make it impossible for him to get a fair trial. The order also bars victims of the July 2012 attack from the hearing, scheduled to start Jan. 27. Holmes pleaded not guilty by reason of insanity to charges of killing 12 people and injuring 70 others. Prosecutors are seeking the death penalty. His lawyers acknowledge he was the shooter but argue he was in the grips of a psychotic episode. Holmes underwent a mandatory sanity evaluation at the Colorado Mental Health Institute at Pueblo last summer. The results have not been made public, but prosecutors asked the judge to allow other doctors selected by the prosecution to examine Holmes. That request will be argued at the January hearing. No phone listing could be found for Metzner. Liz McDonough, a spokeswoman for the state Department of Human Services, which oversees the hospital, said she could not comment. Samour also revealed the specific areas in which prosecutors want their own experts to examine Holmes: whether he was insane at the time of the shooting, and whether he had a mental disease or defect that the defense could use to argue against the death penalty. Samour said he was disclosing the details of the prosecution request because openness is important in the court system and because Colorado law grants victims the right to attend trials and critical hearings. Samour’s 40-page ruling said the upcoming hearing “is one of those rare situations in which closure of a pretrial hearing is not only justified, but required” because of the potential damage to Holmes’ right to a fair trial. More than seven pages of the ruling were redacted. Metzger’s conclusions about Holmes’ sanity will be crucial evidence in Holmes’ trial, but it will be up to the jurors to determine whether he was insane. Colorado law defines insanity as the inability to tell right from wrong. If jurors decide Holmes was insane, he would be committed indefinitely to the state mental hospital. If they decide he was sane and convict him of first-degree murder, he could receive the death penalty or life in prison without the possibility of parole. Prosecutors asked Samour to allow victims to attend the hearing even if the general public is excluded. Samour said if victims were allowed to attend, details of the testimony would inevitably wind up in the media. News organizations including The Associated Press argued against closing the hearing. Steven Zansberg, an attorney representing the media companies, said he hadn’t read the ruling and couldn’t comment.